Puppy Linux 8.0 on 32GB USB Drive | Linux DVD Shop - UK Linux Shop supplying Linux on CD, DVD and USB with Free UK Delivery, 24Hr Dispatch. Puppy Linux 8.0 is targeted users working with older computer hardware. Puppy Linux is similar to Tiny Core Linux and Slax Linux in being able to get those older Pentium PCs back up and running at speed. Puppy Linux is available as a on USB, it comes with a full graphical installation option too and a great set of default programs. The Live USB will bootup on systems with only 768mb of RAM, but the more RAM you have the more Puppy Linux is able to keep files permanently in ramdisk hence more speed. 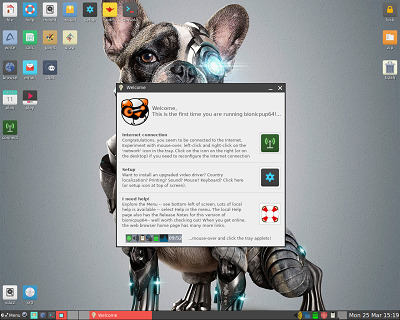 Puppy Linux is very small, and is designed to be reliable, easy to use and fully featured. The entire operating system and all the applications can be run from RAM and the USB stick, allowing the boot medium to be removed after the operating system starts. Included are applications such as SeaMonkey/Mozilla Application Suite, AbiWord, Sodipodi, Gnumeric, and Gxine/xine.